I love this review! It's definitely important to talk about both flaws and strengths in a book like this because many people will take it as the gospel truth about a group. 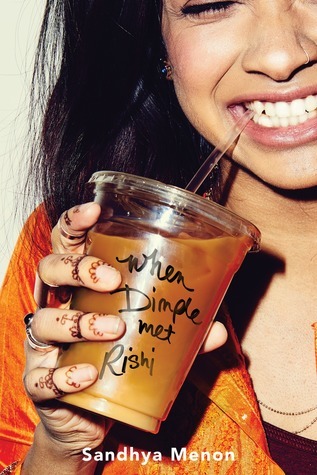 Hopefully this story inspires more authors, not just YA, to write more Indian-American novels from many points of view. Yes, and hopefully it will inspire many readers of all backgrounds to read books about people from different backgrounds than them! And make them realize that we are not that different :-) But that the differences are ok, not threatening. Your review of this book rocks! I can totally understand what you mean about pretty much everything you talked about. I'm Chicana, so when I read Cisneros' book, The House on Mango Street, it was like I had found home. I found a book that had Spanish in it and a book that talked about a culture that was mine and it was awesome. I loved it. So, I can totally dig how much you loved this book owning its culture :) And I know what you mean about the differences in language, because I have the same thing. I speak Spanish, but its different from the Spanish that I learned in school and the Spanish that people in Miami speak. Oh, and I feel the same when people ask where I am from. I always say Homestead, but its not enough. They expect me to name a country, because apparently I can't be from Homestead, FL since that is in America and I don't look American enough to them. Its crazy! Anyhow, I just wanted to say how much I loved your post and related to it. Thanks so much for writing it :) And, I'm happy you enjoyed the book - its on my TBR list. Oh, I love that you have felt the same way! And thanks for the information about the different kinds of Spanish, good to know it happens world-wide for all languages! Please let me know what you think of this book when you read it! You and Jenny both reviewed this book today, and I'd never heard of it before. Why is the girl named (or just called) after indentations on the face? This is oddly off-putting to me. Dimple is the first name of a pretty famous Bollywood actress (who... named her kids Twinkle and Rinkle and had a sister named Simple, which is pretty cruel). The name is not super-common, but it is not as rare as you would think. It's so great that YA books are being published that aren't just white kids as the main characters and that the cultural details in the book are correct. It is too bad though, that it still stereotypical, which I thought as soon as I heard they went to camp to create apps. Hahahaha, very good point, Helen. Actually, now that you mention it, the whole app development thing seems to have just been a way to get them in the same place - it is barely mentioned as an actual app development thing most of the time. You write the.best.book.reports! Honestly. I love the sound of the book for all the reasons you mention, and I know I wouldn't like it for the reasons you didn't. I hope, and expect, there will be more and more books like this. When my kids were little we were always looking for books that dealt with Korean-Americans, or at least had Asian faces. That was 30 years ago, and I don't know what's out there now.